The top stocks to watch today (Tuesday) are eBay Inc. (Nasdaq: EBAY), Rio Tinto Plc. (NYSE ADR: RIO), and Novavax Inc. (Nasdaq: NVAX). The U.S. uninsured rate rose in the first quarter to 11.3% from 10.9% last quarter, according to Gallup and Health Ways. The increase in uninsured is likely due to the uncertainty of the Affordable Care Act over the last couple of months. Yesterday, U.S. Federal Reserve Chair Janet Yellen said they are "allowing the economy to kind of coast and remain on an even keel." It is unknown what that means for future rate hikes this year and shrinking the Fed's $4.5 trillion balance sheet. EBay stock is up 0.97% in early morning trading after Flipkart announced it acquired eBay in India. The pioneer of online buying was one of three large technology companies to invest in Flipkart. Along with the investment, eBay sold its operations in India to the company. Flipkart is hoping to compete with Amazon in India with the purchase and was able to raise $1.4 billion in the current round of funding. In November, the company was valued at $5.54 billion. EBAY stock is currently trading at $34.06 for a gain of 14.7% so far this year. Rio Tinto stock is up 2.3% in early morning trading after it announced its three new mines. 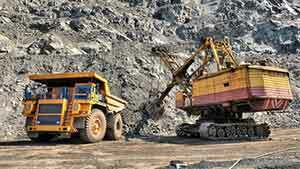 The iron ore mines will be located in Western Australia. The construction contracts are being awarded to local companies, with one awarded to a local indigenous contractor. Ahead of the announcement, three analysts following the company increased the rating to "Buy." The one-year price target for Rio Tinto is $47.88, for a potential gain of 18%. RIO stock is trading at $40.87 for a gain of 6.3% year to date (YTD). Novavax stock is down 3.32% in early morning trading. While there is no clear cause for the large drop, the clinical-stage vaccine company has dropped 88.5% since September 2016, when the phase 3 trial of its RSV vaccine in older adults failed to meet efficacy targets. Currently, Novavax has a phase 3 trial underway for the RSV vaccine in a maternal study. If effective, it would be the first RSV vaccine approved by the FDA. NVAX stock is currently trading at $0.90 for a loss of 28.6% YTD. What ever happened to the internet of things. All those stocks are in the toilet?